Crack it open, eat it, read it, consider it. Figured I’d just go ahead and get that out of the way so that the rest of this article is a little more justified. Oh, also, my mom is a total weirdo, too. That’s essential information. We love any type of Asian food, as Americanized or authentic as it wants to be. It could be Panang curry with tofu from Thai Basil or Bhan Thai or what have you; it could be a spicy tuna roll from Pacific Spice. Heck, it could be a lone bowl of egg drop soup from Hong Kong Star. It doesn’t really matter. What matters is that we enjoy it together, and we enjoy it because we are together, like most things her and I do. We giggle until we choke or hardly talk at all, and the mother-daughter fun doesn’t end when the check comes – it in fact progresses. Fortune cookies are something I am infinitely weird about. The mechanics, the believing, the etcetera. I know it’s gimmicky, but like I do a lot of other things, I take what that stupid slip of paper says to heart. Someone in your life needs a letter from you. Okay, where are the stamps, do we even use stamps, what is a stamp, blah. So these cookies come to the table with our check. Sometimes there’s only one, which is janky, but we share it or she lets me have it. But before I even get to reading, I must first eat my cookie, every last crumb swallowed. Perhaps even a cleansing gulp of water works its way in there. Just to wash it down, just so no cookie remains. What? Yes, you heard me correctly. And I’ve been doing this forever. Like, forever. I have no actual idea where I got it from and why I thought it was important. I still think it’s important today, and I am here to share with you that reason, recently brought to my attention by the mother that shares all my fortune cookies with me. She says there’s reason behind it, that there’s some bit of symbolism I’m subconsciously passing over. And that is this (something that I have become very aware of in light of recent events): you cannot rush into the future; you have to take in all the good stuff given to you before you reach this fate or fortune you’ve got waiting on you. In a metaphorical sense, I guess my fate is my stupid slip of paper, and the “good stuff” is the stale and tasteless thing I force myself to eat before moving on. But sometimes life is just like that: stale and tasteless. And you’ve got to push through the weird, chewy, manufactured or really hard and crunchy parts of life to get to that fortune that might also be tremendously stupid. But that’s also life: such a game of chance – comes to you with your check, right before you check out, and you do something with what you’re given. 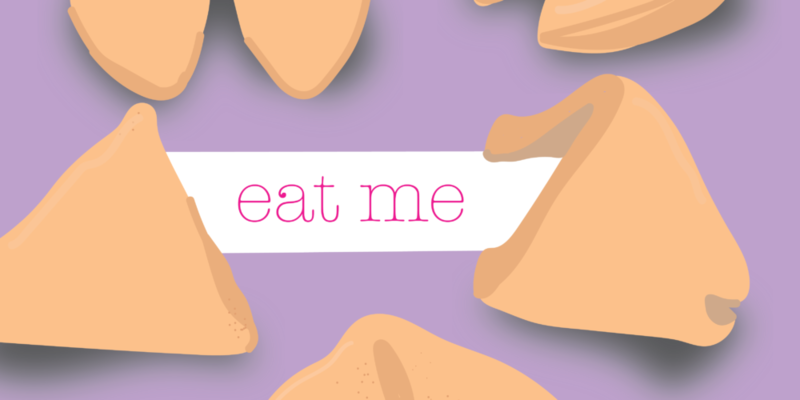 So, if we ever share a fortune cookie or two together, reader, then you’ll know not to question me when I scarf down my cookie while you’re reading off yours already. Maybe you’ll join me in taking life slow; maybe you’ll enjoy the cookie. Oh – and you can’t forget to compare your lucky numbers on the back. How else are you to get your lotto numbers to play? Reed is an ambassador for Grrlpunch, and she really likes ice cream and riding in the car.